Please take a moment to watch this informative video..and pay our thanks to the Civil War Preservation Trust for preserving battlefields and other historic tracts of land for our children’s future education and appreciation. These parks, meadows and gently rolling fields that are forever blessed by the honor and sacrifice of the men who fought and died on the same ground must be protected and preserved for their memories and their gallant actions. They must be preserved for future generations. Our children have the right to know this important piece of our history as we have enjoyed this right. A donation to the Civil War Preservation Trust will assist this great organization in ‘our fight’ to preserve those lands that were the battlefields .. where our brothers from both North and South fought..and fell. Just one visit to a battlefield, and you will “feel” the land and it’s rich history. Please click the link above and make your donation. Here is a recent victory by the Civil War Trust. They secured some of the land where Robert E. Lee and Ulysses S. Grant engaged during The Battle of the Wilderness. Enjoy the video..thank you for your donation. Congratulations on the recent saving of hallowed ground as announced in the above video. Briefly, my work as a Monument Education and Preservation Field Specialist, a Veteran and advocate for preserving and protecting monuments and markers, has afforded myself over the past 15 years the wonderful opportunity to meet with communities, schools and historical societies and conduct and promote the importance of preserving, protecting and in turn sharing the unique historical narratives of their environs. 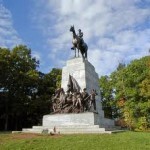 My work has included preservation, repair and conservation of bronze, stone and marble monuments of both Revolutionary and Civil War sites, located along road ways and cemeteries in both urban and rural areas. I am a sole proprietor operator in my work, but I have in the past year been encouraged by numerous veterans and historical society friends to contact your organization, to introduce myself and determine if there might be an opportunity to work for the Civil War Trust and provide my skills and dedication to support the Civil War Trust in both preservation field work and in public advocacy and school educational forum settings. Please feel free to contact me if their is interest in discussing my inquiry in greater detail.